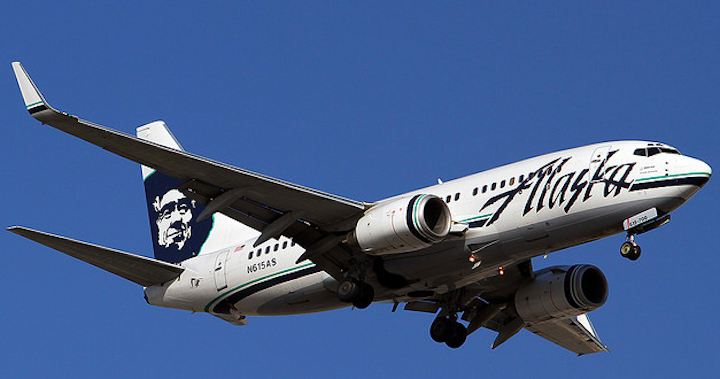 An Alaska Airlines flight headed to Boston from San Diego last night had to make an unscheduled stop midway through the trip, when a drunk passenger allegedly became abusive and threatened the crew, the airline said. A male passenger who was intoxicated “became disruptive,” the carrier said. “He was told to calm down by flight crew, and then became agitated and verbally abusive, even issuing a threat to flight crew,” an airline spokeswoman told NBC News. Another passenger told NBC that the man was upset that the attendants wouldn’t let him drink the small bottles of booze he’d brought with him on the flight. The pilot diverted the plane to the closest airport, landing in Denver “out of an abundance of caution,” the spokeswoman said. Police met the plane and escorted the man off the plane. Cell phone video shot on the plane shows his departure, with the passenger asking, “So what am I, a terrorist?” while some passengers applauded his exit. About 45 minutes later, the flight took off again to continue on to San Diego, where it landed at around 10:20 p.m. According to a spokesperson for Denver International Airport, no charges have been brought in relation to the incident.